Hunt with the Kings of Waterfowl! 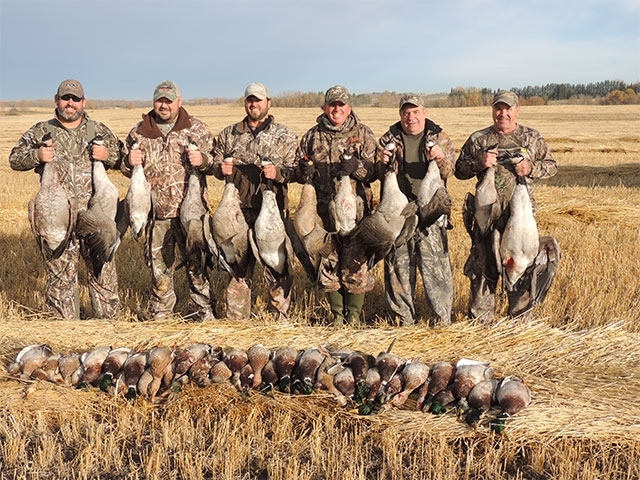 Greater Canadians offers a first class waterfowl hunting experience. Our region in East Central Alberta is approximately 160 kilometers (100 miles) east of the City of Edmonton. The community of Innisfree is our home base, situated on Yellowhead Highway #16. This area is blessed by having an abundance of all duck and goose species. From mallards to teals, snows to specks, they are all available on most hunts, but we feel the Kings of Waterfowl are the Greater Canadians. This area without a doubt, is some of the best parkland waterfowl habitat in North America. With its huge rolling pea and cereal grain fields, and an abundance of fresh water, be it large ponds, lakes or the Vermilion River system, this area is home to one of Alberta's largest, local, Greater Canada Goose populations. We invite you to tour the pages of our site to find the hunt of a lifetime for the "Kings of Waterfowl" .... Greater Canadians! !